To start the week I thought I'd talk all things festive as this past weekend I finally found my Christmas cheer! I may not have my tree up just yet (I'm waiting on new blinds) but feel I have most other things ticked off in the feeling festive department! Below is a little ramble of all things festive that is certain to add some sparkle to your Monday! First up with Christmas jumpers! Above is possibly my first ever festive jumper since I was a child... I'd previously convinced myself that jumpers make me look boxy and frumpy, so they were out of the question. But whilst perusing the Asda website I spotted the above jumper (£14.00 - Goerge at Asda here) which I loved so much I thought I'd give it a try. Thankfully it isn't overly thick, though still warm, and I actually feel it suits me! Plus it gives to the Save the Children charity which is only a good thing. Asda, Tesco and of course Primark really do have some great festive jumpers in this year! Every year I like to treat myself to a China Glaze Holiday gift set as they have the best shades and are ultra glittery, so this year was no different. 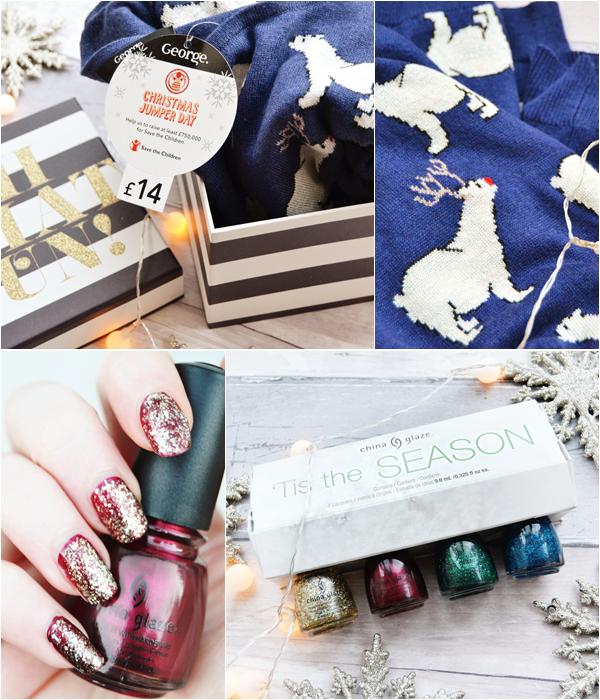 I went for the 'Tis The Season set as not only does it feature some amazing nail polishes but it's only £8.95 with free p&p at Nail Polish Direct here! The set includes 4 miniatures - 1 metallic shade and 3 glitters: Define Good, De-Light, Pin-ing for Glitter and Feeling Twinkly (aren't the names just perfect?!). Above I have on my nails Define Good (ruby red metallic) and De-light (tinsel-like gold glitter). I absolutely love this set! 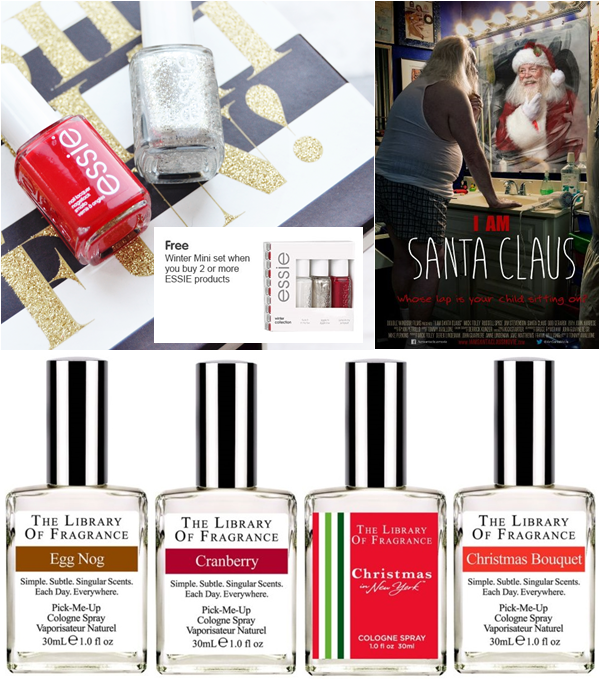 Keeping with nail polish Boots have a wonderful free gift from Essie with any 2 Essie Nail Polish Purchases (£7.99 each here). Simply pick up in-store or if purchasing online the set will be automatically added to your basket. The lovely Winter Mini Kit includes Tuck It In My Tux, Jiggle High Jiggle Low and Jump In My Jumpsuit. This looks a great set with 3 festive shades and would make a great extra gift for someone or to keep as a little treat to yourself. I must say I'm tempted with this offer! Last week I became even more eager to try out The Library Of Fragrance range after watching British Beauty Blogger, Jane's video here on quite a few different scents they have to offer. The perfumes are affordably priced at £15 each for 30ml here or 2 for £25 at the moment. However as I was looking I discovered a special seasonal range that's even cheaper at £9.99 here! At this price I think it's worth just taking a guess at which scent I'd like the most and I'm tempted by Egg Nog strangely... I expect it to be sweet, creamy and of course with a cinnamon scent to it. But I could also imagine the Cranberry fragrance smelling amazing. I will admit I haven't had time for any Christmas film marathons yet... I've actually been moving house! But I have fit in two Christmas films that I loved and had to mention. The first isn't really a film but classed as one and is a documentary called 'I Am Santa Claus' which can be found on Netflix (unblocked to the U.S). The documentary follows various Santas in the lead up to Christmas and also they're private lives. Both festive and interesting and worth watching if you love quirky documentaries. I also recently got around to watching 'Arthur Christmas' (£4.30 - Amazon here) for the first time and loved it! I really can't believe it took me so long to watch it but somehow I convinced myself it wouldn't be as good as people had made out... but oh how wrong I was. I won't go into what it's about other than telling you it's a very Christmas-y watch and worth buying or downloading! Last but so not least I had to mention Christmas eating! Oh, how I like to partake in it. I'm not a huge cookbook cooker but come Christmas time I try to make the effort to put time aside and bake/cook a few festive things. 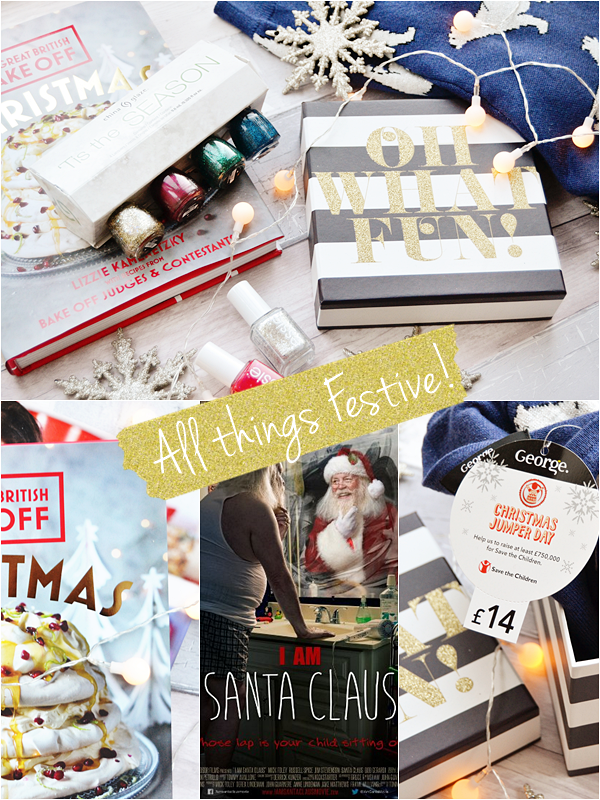 I'm a huge fan of the Nigella Christmas book (£13.60 - Amazon here) which has so many amazing yummy recipes in it - Choc Chip Chilli, Fully Loaded Potato Skins, Macaroni Cheese De Luxe, Yule Log, Cranberry and White Chocolate Cookies and much more. 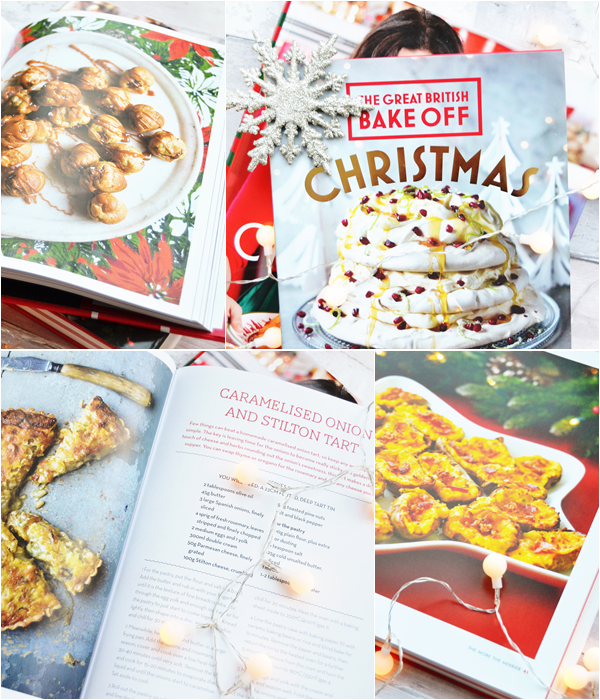 But the newest festive cookbook on the block is The Great British Bake-off Christmas Book (£8.00 - Amazon here). This is possibly even more Christmas-y than Nigella's offering such stunning food photography and amazing recipes. The recipes are more suited to advanced bakers (that's me out then!) but there are recipes that I will attempt and fingers crossed will turn out okay. Recipes that have caught my eye include -Cinnamon and Raspberry Whirl Wreath, Creamy Pork, Apple and Leek Open Pie, Best-Ever Shepherd's Pie, Frangipane Mince Pies and Mini Spiced Apple Doughnuts mmmm. I think the first recipe to try will be the Frangipane Mince Pies. Now that seriously was a festive ramble! I'd love to know what you are doing to feel festive right now plus any Christmas film recommendations would be much appreciated.